Jazz trumpeter Jeremy Pelt is blazing a trail with his hot new release, Close to My Heart on MAXJAZZ Records. The music industry is giving the album much well-deserved praise. It is a must have for your music collection. I had the opportunity to ask Jeremy a few questions about the new album and his music. Please welcome Jeremy Pelt to the j-notes Jazz Lounge. j-notes: Your music has been classified from neo-bop to straight-ahead jazz. How would you describe your sound? j-notes: You have played in every setting from big bands to quartets? Which is your favorite band setting and why? j-notes: You have traveled extensively this year. Where has been your favorite place to play? j-notes: Will your upcoming tours feature a string section? Will you be coming to the Bay Area in the next year? j-notes: How do you select the music for your recordings? j-notes: Are there any other types of music you would like to record? j-notes: Would you consider scoring a film? 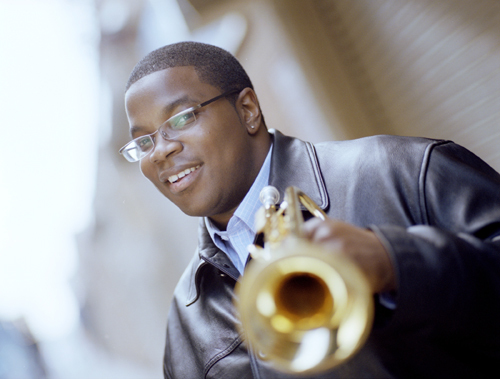 j-notes: What are your thoughts on your comparisons to trumpet great Clifford Brown? j-notes: Who would you like to play with? j-notes: Would you do a tribute album to a great trumpet legend? j-notes: What are the stylistic differences between playing the trumpet and flugelhorn? j-notes: If you were not an outstanding trumpeter, which profession would you pursue? j-notes: What’s next for Jeremy? Thank you Jeremy and please keep the good music flowing! Read more about Jeremy on his personal website, jeremypelt.net or his MAXJAZZ homepage. This entry was posted on Saturday, October 11th, 2003 at 7:48 am. It is filed under Artist Interviews and tagged with Artist Interview, Jeremy Pelt, producer, songwriter, trumpeter. You can follow any responses to this entry through the RSS 2.0 feed. So now, how did you meet up with Jeremy? You’ll lead me to poverty… OK, deeper poverty. I’m intrigued enough to go get the album. Good interview. I’m gonna have to give his CD a listen. nice interview and yea how did you met up with jeremy pelt? he is a very attractive man too. I am truly impressed by your genius. You have mad skills. As always you reach for the stars and bring back a style out of this world Dear Uncle. I am so proud of all your accomplishments and am glad to be able to support you and your efforts as part of The Family.